Our internal energies are like a magnet, both positive and negative forces within us working at the same time. 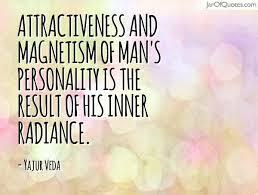 We are human beings trying to align ourself in an often negative external magnetic world. Much of why we give into the way we live is because of our seductive Ego, the irresistible urges of our mind invite us constantly into it’s seemingly charming magnetic pull, like a bewitching stick it captivates us with thoughts of fantasy, most of which never ever come true. In an instant all of the entrancing energy can be gone, only to be replaced with negative repulsive thoughts of dislike and things unattractive. We can become demagnetized with the repelling energy of our Ego in a single breath. Our mind produces forces that often remain a mystery to us, what makes our Ego behave the way it does? Think of your Ego as your outer core, charged with all of the negative patterns that have been handed down to you from your Ancestors. This outer shell of who you are is constantly searching for approval, love, admiration and happiness, but always in the wrong places at the wrong time. Things never seem to line up and if they do fall into place, the lessons that come with that territory are troublesome and difficult. Our Egos magnetic attractions to people, places and things most often have unfavourable and tiresome outcomes. This is why we so often feel defeated and exhausted. When we are aligned with a negative state of mind, we allure and attract people of the same nature to us, negative energy is a magnet for other negative forces. Manifestation does not have to be viewed as supernatural, the materialization of what we desire in our life needs only to be visualized behind our eyes, if what you want is set with good intentions then so it shall be. The powerful magnetic attraction of your Soul is waiting to be a part of your existence and can far surpass the spell of your Ego, mind your thoughts, what you think, is what will become of you.